Wow. This review has been a VERY long time coming. I originally received Allegiance as an ARC for review back in 2011. Yeah. 7 whole years of this book sitting on my shelf unread. I finally picked it up and gave it a go, so here are my thoughts. I originally read the self-published version of Legacy, the first book in this series, which I thought was verbose and needed polishing. I think that working with a publisher helped a lot of those writing issues, but the story was still a little slower than I would have liked. A solid 100 pages could have been edited out of Allegiance, and it wouldn't have suffered. I appreciate Cayla Kluver's worldbuilding ability. The kingdom of Hytanica is incredibly extensive and interesting to read about, and I am certainly onboard to see what's to come. I really had two issues with Allegiance--Alera and Narian. Without giving too much away, I personally started falling far out of love with Narian, and I felt Alera's feelings for him stopped making sense very quickly. That brings me to Alera: I needed more from her. I felt really disappointed in her at times, but was glad she started coming into her own by the end. You can purchase Allegiance on Amazon for $6.25 as a Paperback, and $7.99 as a Kindle copy. 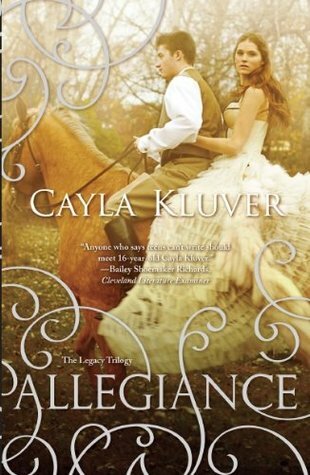 I'm clearing out my bookshelves, so I'm giving away my ARC copy of Allegiance! It's got a few scuff marks, but other than that, it's good to go!